As well as being Nirvana’s frontman, Kurt Cobain was and is today one of the most influential style icons of our times. The posterboy for grunge, Cobain’s style remains influential on the catwalk and on the street – from Marc Jacobs’ SS93 collection for Perry Ellis (which he and Courtney Love burned, after the designer sent it to them as a gift), to Hedi Slimane’s SS16 men’s collection for Saint Laurent, 20 years later. Of course conversation around the musician’s style is ladden with irony: his insouciant, charity-shop aesthetic embodied the very spirit of the Seattle-born music genre and the anti-fashion sentiment it inherited from its forebears of hippie and punk. But as the Cobain’s iconic MTV Unplugged cardigan goes on sale, we look back at five of his definitive style moments – from his appearance on the MTV to his cover of The Face magazine. 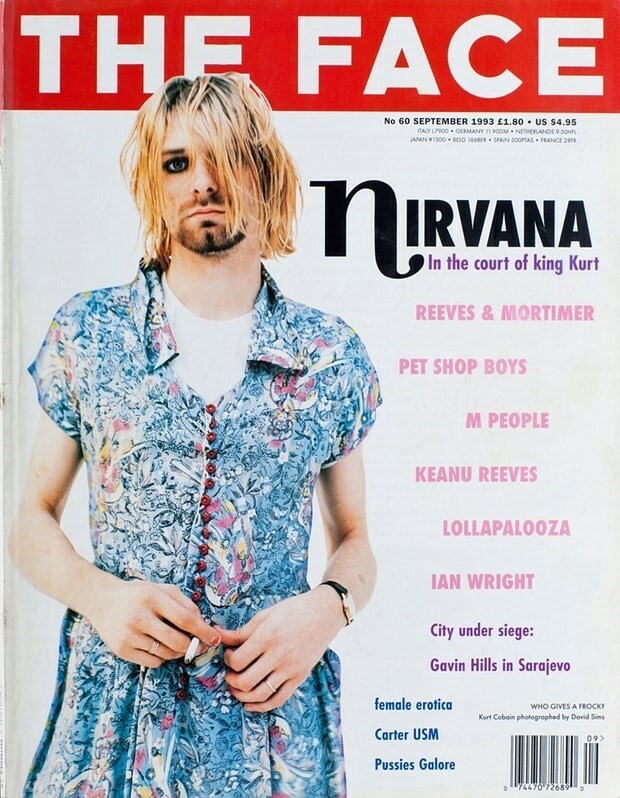 Here, Cobain is photographed by David Sims in a floral frock for the cover of the September 1993 issue of The Face. However this wasn’t the only time musician donned women’s clothing, he frequently wore 40s-by-way-of-70s feminine dresses, (badly chipped) red nail varnish and (badly smudged) eyeliner. Apart from this cover, one of his most famous cross-dressing moments was in 1994, when he wore a yellow high-collared ball gown to MTV Headbanger’s ball. Christian Roth’s oval-shapped sunglasses are a Kurt Cobain staple. 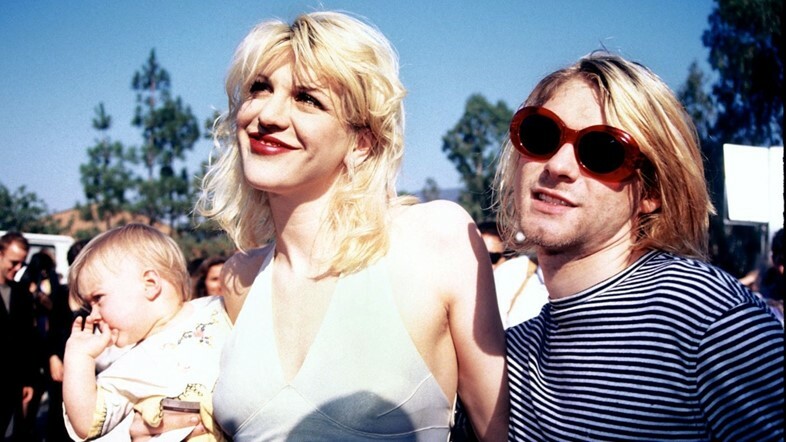 He wore them in white and, here photographed with Courtney Love and their daughter Frances, in red, teamed with a striped t-shirt. These shades made an appearance in Hedi Slimane’s surf-inspired SS16 men’s collection, which was unveiled at Paris Fashion Week this June. 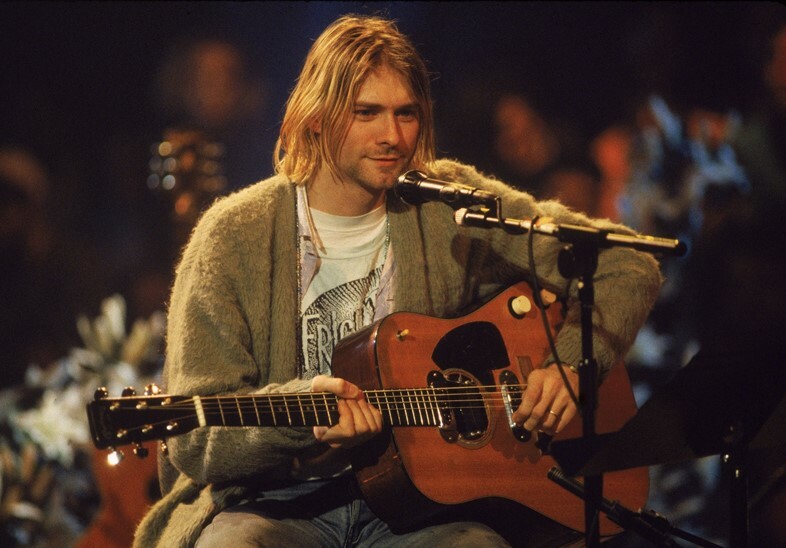 Worn during Nirvana’s ‘MTV Unplugged’ performance in New York on November 18, 1993, Cobain’s fuzzy green cardigan is one of his most iconic items of clothing. Today it was announced that the cardi is going up for auction, where it is expected to reach in the region of £25,000. Complete with a white t-shirt and pair of baggy jeans, the outfit epitomises Cobain’s nonchalant approach to fashion. While the image of Cobain and his tousled blonde locks is embedded deep with in our cultural consciousness, he also experimented with other colours, from electric-blue to slime-green. Most famously, he dyed it red (using heavily coloured soft drink Kool Aid). A crimson-hair Cobain appeared the music video of “In Bloom”, which was released in 1992. A key part of grunge style was its DAF attitude. Clothes were second-hand, sourced from charity shops, unbranded, unwashed, undersized or oversized, miss-matched and, as exemplified here, tattered. It inherited – and amalgamated – this approach to fashion from two of its similarly anti-establishment subcultural forebears: hippie and punk. 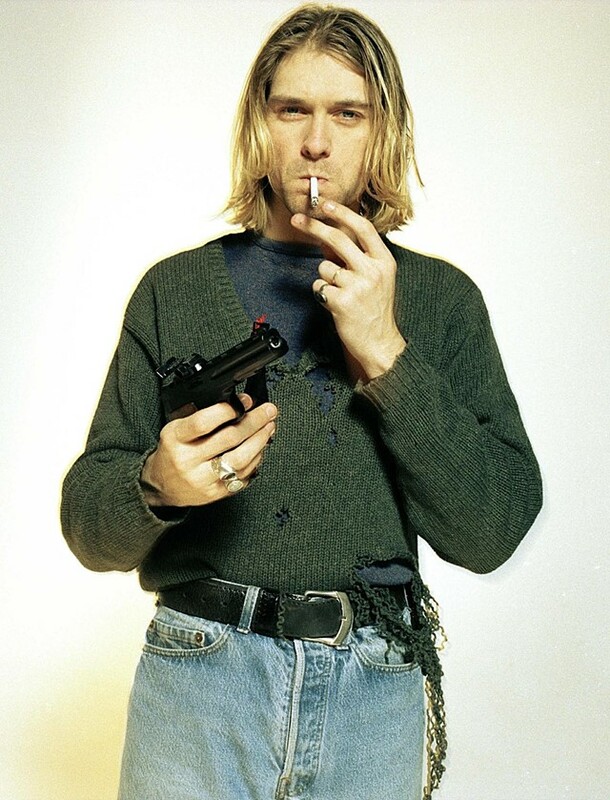 This picture was part of a series of photographs taken by Cobain’s friend Youri Lenquette and were the last taken of him before his suicide on April 5, 1994.